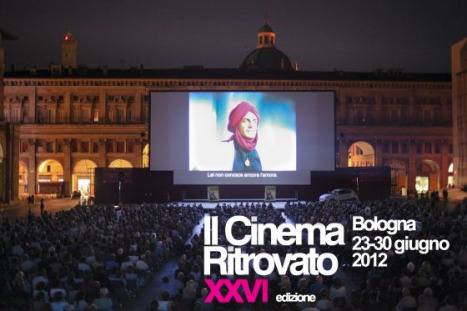 My first visit to Il Cinema Ritrovato in Bologna turned to be a total film festival experience, more so than any other I've experienced. I travel annually to Toronto's TIFF, and have attended festivals in cities like Rotterdam and Montreal but never before was I so strongly engaged with exploring the city itself, its streets and architecture, its restaurants, and witnessing its cultural life. In a nice scheduling touch, there were no screenings for a two-hour period during lunchtime, which permitted a leisurely meal with wine every day. And each night brought a public and festive piazza screening that was attended by hundreds -- the series included Lola, The Grand Illusion, Point Blank, Lawrence of Arabia, and Chaplin, among others. (1) Sonnenstrahl (“Ray of Sunshine”, Pál Fejös, 1933). The only other film I’ve seen by the Hungarian Fejös is Lonesome (1927), made in Hollywood, an absolute stunner, with one of my favorite opening sequences in all of cinema. (Criterion is releasing it soon.) Sonnenstrahl, which he made in Austria, showed as part of a terrific program called “After the Crash: Cinema and the 1929 Crisis,” curated by festival artistic director Peter von Bagh. It’s a film about two young people, desperately poor, who meet on a bridge as they are about to commit suicide. We follow their struggle out of precarious straits and into a tenuous working-class existence. The film sets out to capture their small victories and little joys, even if abjection and disaster are often around the corner. Any thoughts or comments on these filmmakers or on film festivals in general? Please feel free to share. -- Other reports from Bologna: Larry Gross at Film Comment; Kristin Thompson at her blog (see the bottom of her page for links to Meredith Brody's coverage at IndieWire); and Ehsan Khoshbakht at MUBI. Also: the Belgian website Photogénie, that I mentioned in my previous post. -- Ignatiy Vishnevetsky reviews Beasts of the Southern Wild and Magic Mike; Ben Sachs discusses Magic Mike in the context of Soderbergh's body of work. -- Steve Rybin at Cinephile Papers: "David Thomson on Actors". -- Lots of good film reading at Yusef Sayed's website, Insane Horizon. -- Andy Rector posts the translation of an interview with António Reis conducted by Serge Daney and Jean-Pierre Oudart in 1977. -- Kent Jones and B. Kite exchange letters on Bresson. -- David Cairns on Robert Siodmak. -- Chris Darke interviews filmmaker Adam Curtis at Film Comment. -- Paul Ramaeker at The Third Meaning: "Mad Love: The Surrealism of the Supernatural Romantic Melodrama, Part One". -- Katie Kitamura interviews Apichatpong Weerasethakul at the Asian American Writers' Workshop website. -- Issue 1 of the journal Screen Machine focuses "on realism". -- Jean-Claude Carrière: "Godard doesn't like a script. He likes to talk a lot but also to have some pieces of dialogue in his pocket just in case. Buñuel liked everything to be in the script except the technical. The word 'camera' was prohibited. That was his work."